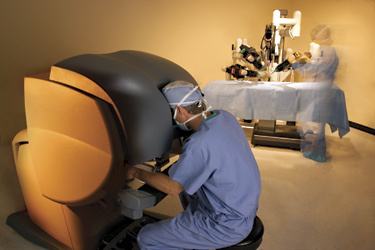 The da Vinci ® Surgical System is powered by state-of-the-art robotic technology. The System allows your surgeon’s hand movements to be scaled, filtered and translated into precise movements of micro-instruments within the operative site. The magnified, three-dimensional view the surgeon experiences enables him to perform precise surgery in complex procedures through small surgical incisions. The da Vinci ® System enhances surgical capabilities by enabling the performance of complex surgeries through tiny surgical openings. The System cannot be programmed nor can it make decisions on its own. The da Vinci ® System requires that every surgical manoeuvre be performed with direct input from your surgeon.